Reading and share top 46 famous quotes and sayings about Fisherman by famous authors and people. 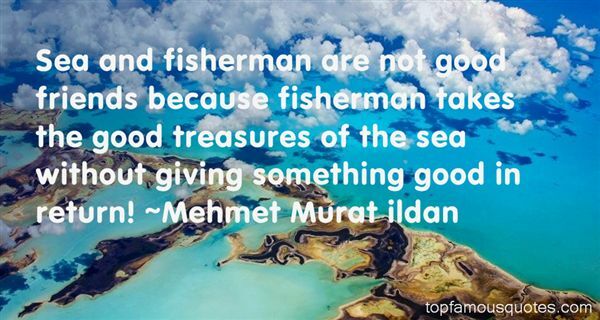 Browse top 46 famous quotes and sayings about Fisherman by most favorite authors. 2. "Sometimes Stuart seems like an irritable fisherman. He bobs about, on the disruption of his life, a small, unsteady figure, fishing for order. Then he gets into a rage, 'goes right on one', and it is as if he's taken out the gutting knife and mashed his catch to a pulp - every sign of hated, repressive, reminding order is gone again." 3. "Before roaring over Fingap Falls, the River Blapp was wide and peaceful, clear as a spring, and the fish to be caught there were both delicious and docile, except for the many fish that were poisonous to the touch, and the daggerfish that were known to leap into boats and impale the stoutest fisherman." 4. "A true book is like a net, and words are the mesh. The nature of the mesh matters relatively little. What matters is the live catch the fisherman draws up from the depths of the sea, the flashings of silver that we see gleam within the net." 5. "Subjecting oneself to a great work of art stings the pride of autonomy. Familiarization calls for a throbbing concentration on background techniques – the ways of nature, society, culture; observing life becomes the sacrifice of it. Laughing at masterpieces and lachrymose towards practicality, the man impervious to beauty drinks his saliva and cries into soup bowls – his body the source of all vital nourishment. Tea and toast he saves for his superiors, serving his way to a house with a swimming pool filled from his ducts. The high saline content making lifeguards unnecessary, his only child is one day found floating the wrong side up. In despondency the man turns to a seascape by Turner. Surely, God must have been a little sad to shed such a vast thimbleful of creation and sigh so many waves. The man feels akin to Turner's fisherman with his lantern – a maritime Diogenes searching for an honest sublimity." 6. "As a teenage fisherman, I watched and followed terns to find fish. Later, I studied terns for my Ph.D."
7. "Writing makes me hard, like a fisherman, and brown from the heat. Tossing out and reeling in is a job for visionaries and those with calloused hands." 8. "Foreign stars in the nights down there. A whole new astronomy Mensa, Musca, the Chameleon. Austral constellations nigh unknown to northern folk. Wrinkling, fading, through the cold black waters. As he rocks in his rusty pannier to the sea's floor in a drifting stain of guano. What family has no mariner in its tree? No fool, no felon. No fisherman." 10. "Across the road from my cabin was a huge clear-cut--hundreds of acres of massive spruce stumps interspersed with tiny Douglas firs--products of what they call "Reforestation," which I guess makes the spindly firs en masse a "Reforest," which makes an individual spindly fir a "Refir," which means you could say that Weyerhauser, who owns the joint, has Refir Madness, since they think that sawing down 200-foot-tall spruces and replacing them with puling 2-foot Refirs is no different from farming beans or corn or alfalfa. They even call the towering spires they wipe from the Earth's face forever a "crop"--as if they'd planted the virgin forest! But I'm just a fisherman and may be missing some deeper significance in their nomenclature and stranger treatment of primordial trees." 11. "Manifestation is an act of trust. It is the soul pouring itself out into its world, like a fisherman casting a net to gather in the fish he seeks; with each cast properly made, we will bring what we need to us, but first we must hurl ourselves into the depths without knowing just what lies beneath us." 12. "What you must remember is that the magic itself is neither good nor bad, no more so than this ship might be used for right or wrong. It might be used by a fisherman to feed a village, for example. Or, the same vessel might be sailed by pirates to murder and pillage...the lumber, rope, nails, cotton, and everything that goes into it-is created by the True One. Humans decide how it is to be put together and how it is used." 13. "Anyone can be a fisherman in May." 14. "From the sun did I learn this, when it goeth down, the exuberant one: gold doth it then pour into the sea, out of inexhaustible riches, -So that the poorest fisherman roweth even with golden oars! For this did I once see, and did not tire of weeping in beholding it. - Like the sun will also Zarathustra go down: now sitteth he here and waiteth, old broken tables around him, and also new tables half-written." 15. "Aureliano Segundo was deep in the reading of a book. Although it had no cover and the title did not appear anywhere, the boy enjoyed the story of a woman who sat at a table and ate nothing but kernels of rice, which she picked up with a pin, and the story of the fisherman who borrowed a weight for his net from a neighbor and when he gave him a fish in payment later it had a diamond in its stomach, and the one about the lamp that fulfilled wishes and about flying carpets. Surprised, he asked Ursula if all that was true and she answered him that it was, that many years ago the gypsies had brought magic lamps and flying mats to Macondo. "What's happening," she sighed, "is that the world is slowly coming to an end and those things don't come here any more." 16. "I am an obscure and patient pearl-fisherman who dives into the deepest waters and comes up with empty hands and a blue face. Some fatal attraction draws me down into the abysses of thought, down into those innermost recesses which never cease to fascinate the strong. I shall spend my life gazing at the ocean of art, where others voyage or fight; and from time to time I'll entertain myself by diving for those green and yellow shells that nobody will want. So I shall keep them for myself and cover the walls of my hut with them." 17. "Then a dark shape would glide across the star-covered sky, everyone would look up and the laughter would stop. It wasn't exactly what you'd call fear, rather a strange sadness--a sadness that had nothing human about it any more, for it lacked both courage and hope. This was how animals waited to die. It was the way fish caught in a net watch the shadow of the fisherman moving back and forth above them." 18. "Death is like a fisherman who has caught a fish in his net and leaves it for a time in the water: the fish still swims about, but the net surrounds it, and the fisherman will take it when he wishes." 19. "There are always new places to go fishing. For any fisherman, there's always a new place, always a new horizon." 20. "I should never make anything of a fisherman. I had not got sufficient imagination"
21. "A beggar who goes fishing may use a worm which has feasted on a king as his bait. And the fisherman may eat the fish caught with that bait. What does this tells us? Well, it tells us that a king may progress through the guts of a pauper." 22. "The frantic summer fishermen who pay a price and glut the decks with fish in the afternoon wonder vaguely what to do with them, sacks and baskets and mountains of porgies and blows and blackfish, sea robins, and even slender dogfish, all to be torn up greedily, to die, and to be thrown back for the waiting gulls. The gulls swarm and wait, knowing the summer fisherman will sicken of their plenty. Who wants to clean and scale a sack of fish? It's harder to give away fish than it is to catch them." 23. "Believe me, I know all about bottle acoustics. I spent much of the sixth century in an old sesame oil jar, corked with wax, bobbing about in the Red Sea. No one heard my hollers. In the end an old fisherman set me free, by which time I was desperate enough to grant him several wishes. I erupted in the form of a smoking giant, did a few lightning bolts, and bent to ask him his desire. Poor old boy had dropped dead of a heart attack. There should be a moral there, but for the life of me I can't see one." 24. "But why would they do that? What is to be asked? 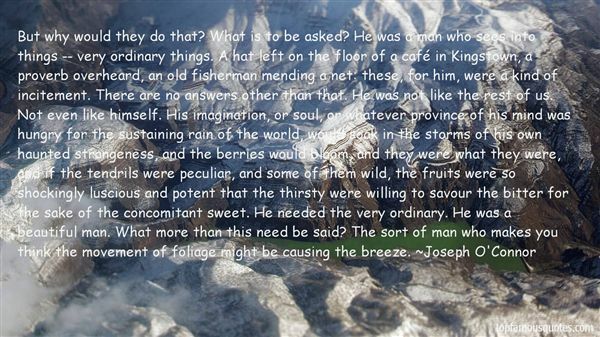 He was a man who sees into things -- very ordinary things. A hat left on the floor of a café in Kingstown, a proverb overheard, an old fisherman mending a net: these, for him, were a kind of incitement. There are no answers other than that. He was not like the rest of us. Not even like himself. His imagination, or soul, or whatever province of his mind was hungry for the sustaining rain of the world, would soak in the storms of his own haunted strangeness, and the berries would bloom, and they were what they were, and if the tendrils were peculiar, and some of them wild, the fruits were so shockingly luscious and potent that the thirsty were willing to savour the bitter for the sake of the concomitant sweet. He needed the very ordinary. He was a beautiful man. What more than this need be said? The sort of man who makes you think the movement of foliage might be causing the breeze." 25. "John felt grounded again. He remembered his favorite Bible story, the one about Peter getting out of the boat and walking on water. The big fisherman was walking along quite nicely until he looked at the waves and began to sink. As much as possible, John tried to live his life without looking at the waves. But when he did, when the lives of his grown children caused his faith to waver even a little, God always sent someone to illustrate the words of Christ: "You of little faith . . . why did you doubt?" John felt certain that in this, his most trying season yet, the Lord had sent Pastor Mark to fill that role. It was a certainty that kept his eyes where they belonged—off the waves and straight ahead to the outstretched arms of Jesus." 26. "Samson had a knack for this kind of insight: he was like a grinning fisherman who could wrench a secret from the depths of your chest and dangle it in front of you, revealing it to be nothing but a common, mud–colored fish." 27. "A lone fisherman up early looking for sea trout found the first body." 28. "Ting. Tingle, tingle, tremble toes,She's a good fisherman, catches hens, puts ‘em inna pensWire blier, limber lock, three geese inna flockOne flew east, one flew westOne flew over the cuckoo's nestO-U-T- spells out… goose swoops down and plucks you out." 29. "Feast for the Fisherman, the ultimate emo band. Said to be sold with a complimentary prescription for antidepressants and a free flatiron." 30. "And what else did you find? ''God' he said simple. 'In a diner. ''What was he eating? 'The question was so unexpected Gamache hesitated then laughed. 'Lemon meringue pie. ''And how do you know He was God?'... 'I don't,' he admitted. 'He might have been just a fisherman. He was certainly dressed like one. But he looked across the room at me with such tenderness, such love, I was staggered...then he turned back to me with the most radiant smile I'd ever seen. I was filled with joy." 31. "They eat the dainty food of famous chefs with the same pleasure with which they devour gross peasant dishes, mostly composed of garlic and tomatoes, or fisherman's octopus and shrimps, fried in heavily scented olive oil on a little deserted beach." 32. "When we see a lonely fisherman, we ask where the boat is; when we see a lonely boat, we ask where the fisherman is! We love to see the good friends always together!" 33. "Sea and fisherman are not good friends because fisherman takes the good treasures of the sea without giving something good in return!" 34. "A poor fisherman who knows the beauties of the misty mornings is much richer than a wealthy man who sleeps till noon in his palace!" 35. "The fish,Even in the fisherman's net,Still carries,The smell of the sea." 36. "Christian legend later claimed that Peter also went to Rome and there became head of the Christian community, that is, a bishop. Both Peter and Paul, according to the Catholic version, died as martyrs in the Eternal City. Paul definitely went to Rome, and may have been martyred there. But that Peter, a very devout, timid Jewish fisherman, uneducated, and knowing little or no Greek, and no Latin, would have ended in Rome is most unlikely. Thus the whole claim of later bishops of Rome (the popes) that their authority in the Church was derived from its alleged first bishop, Saint Peter, was likely wishful thinking, if not an absolute hoax, that developed in the late second century A.D."
37. "I knew from the time Willie was only a little boy that he could sell beachfront property in Iowa if he put his mind to it. When I was a commercial fisherman, Willie sold fish on the side of the road with Kay or me. Willie can still quote some of the sales pitches: "Yes, sir, these are golden buffalo, the pride of the Ouachita River." Willie was even selling carp, a worthless fish you couldn't sell at the fish market, but he was able to unload quite a few of them with his salesmanship and charm. Willie always said if you can sell fish, you can sell anything. He sold candy from his locker while he was in elementary school and sold worms from an old wooden boat on our river dock. The boy always knew how to make a dollar." 38. "Once upon a time, a fisherman went out to sea. He caught many fish and threw them all into a large bucket on his boat. 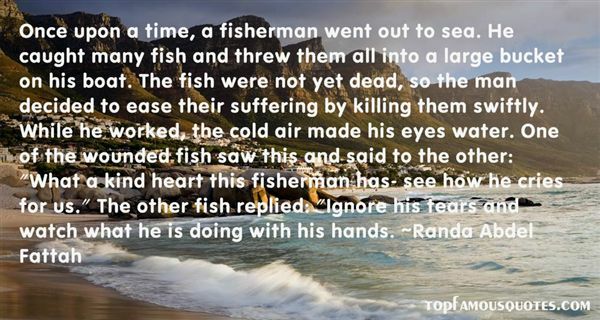 The fish were not yet dead, so the man decided to ease their suffering by killing them swiftly. While he worked, the cold air made his eyes water. One of the wounded fish saw this and said to the other: "What a kind heart this fisherman has- see how he cries for us." The other fish replied: "Ignore his tears and watch what he is doing with his hands." 39. "The fisherman of the Colombian coast must be learned doctors of ethics and morality, for they invented the word sentipensante, or ‘feeling-thinking' to define language that speaks the truth. Eduardo Galeano"
40. "When the snipe and the mussel struggle, the fisherman gets the benefit. Ancient Chinese saying"
41. "The disaster in the Gulf was no accident. It was the result of years of oil money buying off politicians to lead to an unregulated and ill focused addiction to oil and drilling. The doomed fate of the local fisherman and the environment were foretold in the infamous chants of 'Drill, Baby, Drill.'" 42. "I've seen only painters and fishermen and I think they're both the same kind of men who made a different choice one time in their lives. The fisherman held a rod in his hand and said yes and the painter held a brush in his hand and said yes and sometimes I hold a beer in my hand and say yes." 43. "You know, I met a wise man centuries ago in China who said to me, ‘He who lets fear rule him, has fear for a master. (Acheron)Confucius? (Talon)No, Minh-Quan. He was a fisherman who used to sell what I'm told was the best zong zi ever made. (Acheron)"
44. "I shall fear not. According to the Testament of Mezerek, the fisherman Nonpo spent four days in the belly of a giant fish," said Constable Visit.The thunder seemed particularly loud in the silence. "Washpot, are we talking miracles here?" said Reg eventually. "Or just a very slow digestive process?" 45. "The sort of fish that a good fisherman puts back into the water"
46. "… the fisherman's daughter grinding serenity in her coffee grinder." He caught up with her outside her doorway, when she almost gave up. He said nothing, simply pulled her into his arms, against his strong, hard body, and his hand slid beneath her hair, tilting her face up to his. "No more running away?" His voice was rough.His eyes glittered down into hers, and if she wanted tenderness it wasn't there. Simply a dark, naked heat sparking between them. "No more running away," she said."